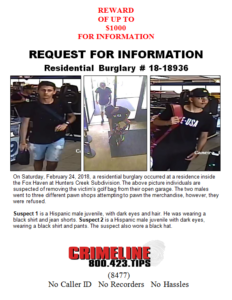 On Saturday, February 24, 2018, a residential burglary occurred at a residence inside the Fox Haven at Hunters Creek Subdivision. The above picture individuals are suspected of removing the victim’s golf bag from their open garage. The two males went to three different pawn shops attempting to pawn the merchandise, however, they were refused. Suspect 1 is a Hispanic male juvenile, with dark eyes and hair. He was wearing a black shirt and jean shorts. 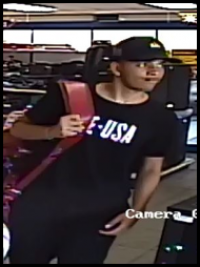 Suspect 2 is a Hispanic male juvenile with dark eyes, wearing a black shirt and pants. The suspect also wore a black hat.